The stern warning issued by the governor of Edo State to Ijaw communities in his state over their attempt to install a traditional ruler to preside over their affairs calls for serious concern. For governor Obaseki to insinuate that Edo people are merely tolerating Ijaw people is unbecoming of a state governor. It is common knowledge that apart from the Oba of Benin, there are several other traditional rulers who of course do not replace the Oba but assists in the governance of their people, therefore, one wonders why it is a taboo for the Ijaws to nominate a traditional chief to oversee their own affairs. Personally I believe that the ethnic interwoven nature of the Niger Delta requires a concerted effort from government towards promoting peaceful cohabitation rather than fan the embers of division. The mere fact that one ethnic group have a population advantage over another does not make them owners of the land. The Bini’s have always lived peacefully side by side with their Ijaw neighbours for several decades until recently when Ijaw communities became economically important. As a government and as responsible citizens, our effort must be geared towards deemphasizing ethnicity in the interest of nationhood in order to avoid the catastrophic costs associated with intertribal crisis. 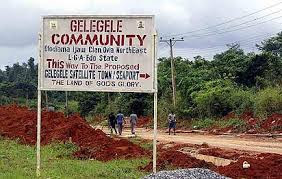 Gelegele-gbene people must be treated as equal citizens of Edo State especially because they are in their ancestral land even though they are surrounded by Benin people. We must also remember that even in Bayelsa State where Ijaws are the predominant tribe, an Urhobo village inhabited mainly by Urhobo people can still be found in Sagbama Local Government Area of the state. Can the Ijaws chase them out of Bayelsa State due to their small population? Obviously not. A popular Bini folklore made it clear that, when the Bini’s first arrived in Edo State from Ile Ife, they met fisher men living in small communities scattered all over the riverine areas of Edo State. The British had referred to those fishing communities as fishing ports, these were small villages that depend on products from the sea. The Ijaws were mainly primitive people at that time living off the sea and farm products from nearby villages. They were traditional worshippers, believing in sea gods. They were not interested in mass acquisition of land, hence, they welcomed visitors/settlers with open arms provided such settlers were willing to travel far inland. Hence, when the Bini’s came to Edo State, they were welcomed by the Ijaws. A popular Bini folklore was that when the Oba and his people arrived from Ile Ife, they were ferried in canoes across the river by Ijaw fisher men living in villages around the riverine areas of the state. This is a very popular and widespread narrative which every Edo man is aware of. The Ijaws of those days were more interested in protecting their immediate settlements, hence, they made the mistake of not possessing the entire land in Edo State even though they were the aborigines. In contrast, the Bini’s from Ile Ife were more sophisticated, they were farmers with a well organized monarchy system of government in place, on arrival to Edo State, the traditional monarchy system they had brought from Ife continued, they travelled far inland away from Ijaw settlements and wasted no time in possessing the land around them (excluding Ijaw areas) for agriculture. They traded with the Ijaws and lived peacefully with their neighbours for many decades, however, this peaceful co-existence was shattered when oil exploration began in the Niger Delta, it turned out that many Ijaw settlement all over the Niger Delta became oil producing communities, the oil found in their territories made them a target of persecution by their neighbours. The Ijaws are the sacrificial lamp of the Niger Delta, they are persecuted by their Niger Delta neighbours and the Nigerian State. They face constant harassment and bombardment by the Nigerian army and their neighbours. Many Ijaw sons and daughters have died fighting for a better Niger Delta, yet, whenever any project is to be approved in Ijaw territories, their neighbours will either lay claims to the land, oppose the projects, demand for a change of name or for a lion share even when such projects are as a result of years of struggle by the Ijaws. Due to the constant hostility and lack of opportunities to Ijaws in Edo State, the population of Ijaws in the state have declined significantly in the last 25 years as many Ijaws have migrated to Delta, Bayelsa, Ondo and Lagos state. As it is now clear that the Ijaws will make a stand on Gelegele-gbene and the other remaining Ijaw settlements, efforts must be made to avert Edo State from becoming a war zone. Every citizen of the state should be carried along in the interest of peace and fairplay. The political exclusion of Ijaws in Edo State must be addressed so that they can also have their turn in Edo State Government House. Above all, the Bini’s must realise that it is impracticable to expect Ijaws to leave their ancestral land.